Adam Yarmark glazes this stoneware piece in a gradient of blues that resemble the sky at dusk and dawn. Is a casserole ever not made with love? Of course not, which is why it deserves this baking dish. Alan Yarmark hand throws the substantial piece, glazing it in a gradient of blue shades that resemble the sky at dusk and dawn (he lives in Colorado, where beautiful scenery was invented). It makes a thoughtful gift for mom, hostess, and cook— which could all be the same delightful person. Handmade in Colorado. 5" H x 12" Dia. I love the color of the glazed on the dish and lid, reminding me of Colorado and the breathtaking Rocky Mountains. It is rustic yet elegant. I will enjoy cooking and serving my favorite casseroles in it. 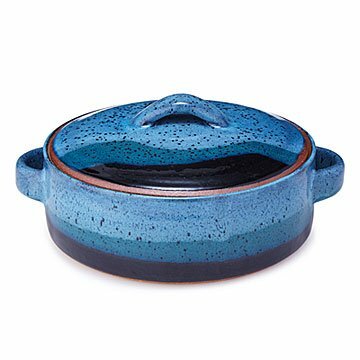 The item I received only resembled the picture in shape I received a casserole dish that looked nothing like the picture. Instead of gradations of blue as the name implied, the dish is all blue. The picture was totally deceptive. I would hesitate to purchase from uncommon goods again. They could not even guarantee that I would receive the right item if I were to exchange it since they seemed to have no control over the artist's items they are distributing.